Are there any areas of your life that are not included on your dashboard? Perhaps you have investment accounts, accounts with no online banking facility, or you simply want to track the money you keep in your wallet. We've recently launched the new, more intuitive Manage Accounts page, where we have introduced new functionality that enables you to keep track of every area of your financial life, making money management and budgeting even easier. 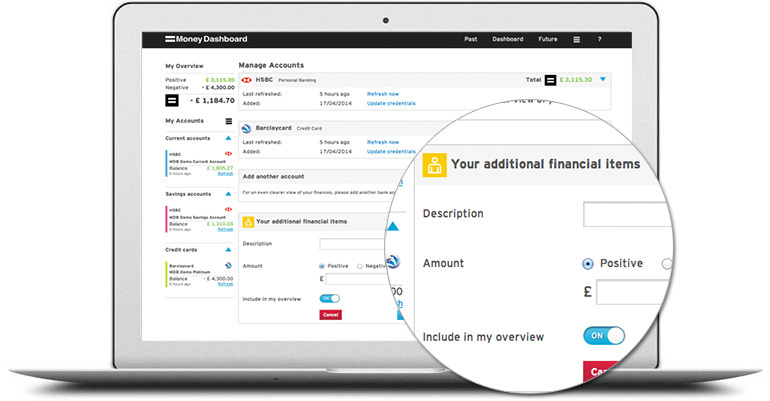 If you select the Manage Accounts option in the My Accounts menu on the left hand side of your Dashboard, you will now see a new section called Your additional financial items. Here you can add any additional financial items that are not currently represented on your Money Dashboard and they will show under your other aggregated accounts on the left hand side. You can name these additional items and enter their balance, which can be edited at any time. You can also choose whether to have these balances included in your total balance on your My Overview section. You can now make your accounts any colour you like so you can differentiate between them throughout the app. Simply select the account that you want to re-colour, click on the colour box and select the colour you want. Top tip: Group all of your credit cards, savings and current accounts in different shades of the same colour  that way you'll not only be able to tell your accounts apart, you can mark similar accounts with similar colours. You can now edit your accounts and login details on mobile. You can also add and edit all of your new additional financial items. Log in and check it out for yourself now.